In stock. Order in the next 17 hours, 18 minutes and it will go out today! This is a classic table trick, Buddha Papers Mystery you should find it useful when performing for only a few spectators. Next he places the packet in the center of a green colored square sheet of paper, as before he folds it into a small packet. Finally he places this packet in the center of a pink colored square sheet of paper, again he folds it into a small packet. 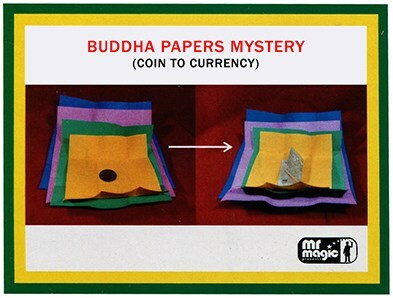 This is placed on the table covered for a minute by the performer's hand, then reopened with a surprise- the coin placed within the innermost packet is found to have changed to a currency note! During performance spectators handle the papers themselves, which make them thoroughly intrigued with the effect. NOTE: The packaging for this product is labeled coin to currency.